If you’ve ever shopped for a direct selling platform, you know that there’s truly no such thing as one-size-fits-all. Some direct selling companies are small and growing fast. Others are well established around the globe, and are tapping into emerging markets on nearly every continent. Each of these companies has different needs from their software. Each needs to be able to implement one component at a time, adding more when business needs dictate and budgets allow. We’ve kept all of this in mind as we re-architected our flagship direct selling platform, Prowess. 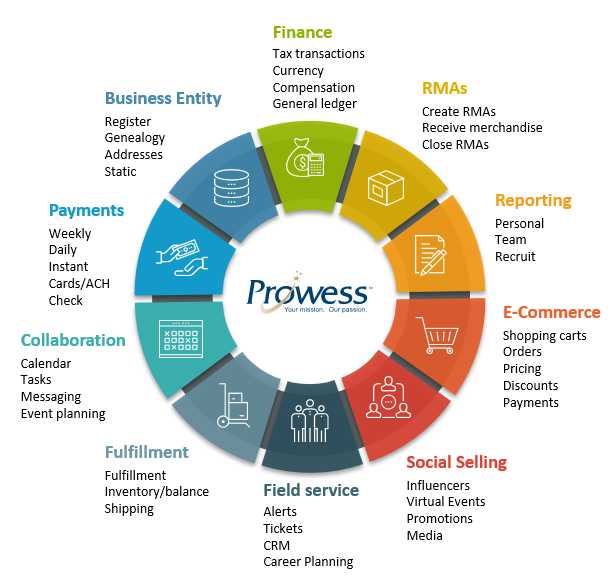 And we’re glad to announce that Prowess gives you the direct selling functionality you need while letting you implement one component at a time. We built Prowess based on feedback from direct selling professionals like you. We think it’s a great choice for companies that want to take advantage of growth opportunities in an ever-changing global market. You may have noticed that in recent years, direct selling growth in North America has leveled off a bit. Business is still going strong here—but it’s not exploding the way it is in some other countries around the globe. So if you’re really serious about growing, you’ll want to tap into new markets. And you’ll need software that can support you on that journey. Prowess is designed to deliver the new functionality you crave on a modular basis. You’ll also need to be flexible to the changing needs and desires of your distributors and potential distributors here in North America. There was a time when direct selling firms could attract distributors by promising big bucks. But most of today’s distributors aren’t daydreaming about riches when they sign on—they just want a fun side gig that they can do in their spare time. They want to be able to manage that side gig on their mobile devices, from anywhere. They’re used to being able to customize any web interface to show only the content that’s most important to them. And they expect you to keep rolling out tools that can increase their productivity. With the Prowess direct selling platform, you can make your plan for implementing new functionality as your business continues to grow. Don’t forget that with growth will come greater complexity for your corporate office. You may want to add new tiers of distributors, unveil new lines of products, and even support multiple office or warehouse locations. Prowess lets you ramp up on your own timeline. Want to stick with just one component? That’s fine with us. But if you ever change your mind, you can easily add more components to your solution. Find out more about Prowess.